It looks weird that the average bomber prices went down. It has to do with the strange gyrations of Hopworks IPA bomber prices, which have seemed almost random the last few months. The shelf price of that beer fell $2.50 at one place I survey. So that's the price drop. Everything else is going up in price. $9 seems like a lot for a six-pack. I feel like I'm usually finding something I can stand under $8 (and a couple lucky $6 finds recently). 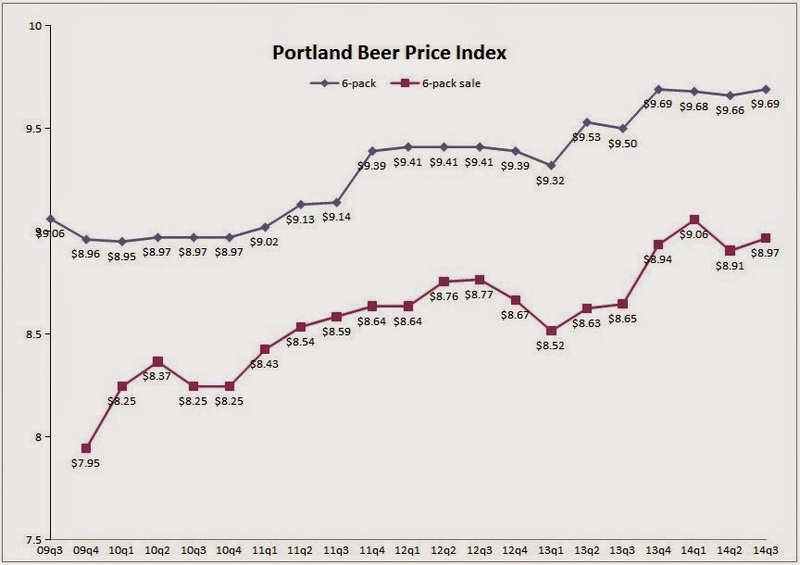 But these are just the averages of a fixed set of Oregon beers. Speaking of which, since Laurelwood Red is now a six-pack beer and no longer in bombers (hooray! ), I replaced that bomber with Base Camp In-Tents IPL. (That change would also have changed last quarter's numbers, so the up/down numbers above are apples-to-apples as if Base Camp was in last time.) The only hiccup there is that QFC doesn't carry Base Camp right now, but it's a pretty popular supermarket beer these days so I hope they will figure it out pretty soon. Consult the PBPI configuration page for more information on the makeup of the index. See you in three months. Five fitty-eight?? That's a ton of money (over 18 bucks for a SPE). I get why bombers are great for small breweries with no bottling lines, but I don't get why anybody buys the damn things. They're getting close to the price of a pint (SPE $22), which carries with it the cost of bar staff and site costs and so on. It would be interesting to compare these to the price of pony, half and full kegs as well. There was a general price increase on beer at cost on October 1st. 6 packs and 12 packs more impacted than most bombers in this round. 6 packs of Widmer and Bridgeport for example went up $1.04 per case.